Demolition is already underway at the old Vallco Mall in Cupertino, but a community group says it has enough signatures to put a referendum before voters in hopes of putting a halt to the massive development planned at the site. Kris Sanchez reports. Demolition is already underway at the old Vallco Mall in Cupertino, but a community group says it has enough signatures to put a referendum before voters in hopes of putting a halt to the massive housing and commercial development planned at the site. 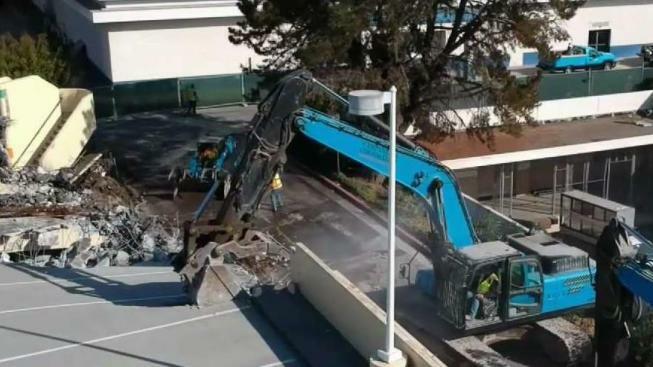 Demolition of the mall started as soon as the Cupertino City Council accepted the Sand Hill Property Company's development plan, but the group "Better Cupertino" wants to stop development, saying it's all happening too fast. In the time it will take to qualify the signatures and possibly place the issue before voters, demolition and construction will continue at the mall site due to previously-passed Senate Bill 35. The bill — intended to streamline the process of creating affording housing — allows projects with certain levels of affordable housing to bypass some local ordinances. The developer now says that instead of the community plan that it had been working on with the city of Cupertino, it will now focus on the plan fast-tracked by SB 35. In a statement, the Sand Hill Property Company managing director said, "This latest obstruction, and the two-year delay it causes, gives the Community Plan no chance to catch up to the already approved and under-way Vallco Town Center project. We consider ourselves patient people, but our patience has finally run out." As the referendum process moves forward, so too will demolition crews.